With all the investment scam issues hounding our nation these days, I do hope that Pinoys have learned their lesson well. There's no such thing as easy money; not unless you get involved in illegal activities. :) Hence, any investment company that's barely new yet promising to double your money or even earn you a percentage higher than what banks offer is most likely a scam. Otherwise, the keyword shouldn't be "trading" but "investing" with the latter designed for a long term approach such as what Bo Sanchez had been promoting through their Truly Rich Club group and via various books such as the The Turtle Always Wins (How to Make Millions in the Stock Market) which I was able to read a few months back and now My Maid Invests in the Stock Market. 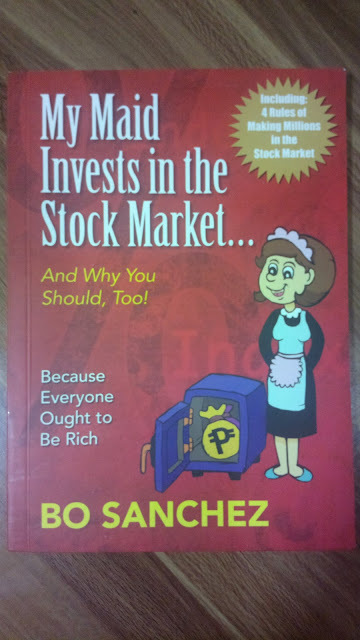 The author suggests budgeting at least Php 2,000 every month with all other expenditures taken cared of. This amount should be segregated monthly and allotted for this purpose. Bro. Bo recommends investing regardless of the economy's status. Since their program is designed for long term investing, members are encouraged to continue adding funds regardless of the stock market's movements. Only major companies are invested upon. Penny stocks or companies that are yet to prove anything are avoided. Diversify by investing in several companies that are financially doing well. To start investing, the book also outlines how you can begin through COL Financial.